The Must-Have Unique & Unusual Gift for Mother's Day! With Mother’s Day approaching, what’s better than giving Mom the spa day she’s always wanted, at home? Surprise her with the perfect must-have item that will leave her with silky, smooth feet she’ll want to show off all summer long! Amopé , the leading premium women’s footcare brand has an amazing bestseller – the Amopé Pedi Perfect Electronic Foot File with Diamond Crystals – designed to buff away thick and stubborn skin effortlessly, leaving feet touchably soft and visibly smooth and beautiful. 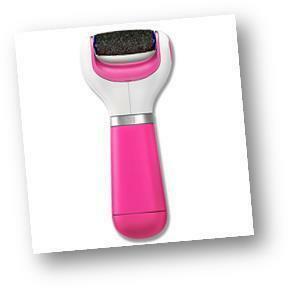 The Amopé Pedi Perfect Electronic Foot File contains finely ground diamond crystals in each of the three different intensity roller heads, which make for perfect exfoliators and extends the life of pedicures in a matter of minutes. I absolutely love my Amopé Pedi Perfect Electronic Foot File. Did you know that the skin on our feet is 20 times thicker than it is anywhere else on your body? That means we have quite a few layers of roughness to get through before the soft, underlying skin is exposed. I use my Amopé Pedi Perfect Electronic Foot File right after my shower, when my skin on my feet is still a bit soft and easier to remove. My feet are transformed after ten minutes! All of my scaly, rough skin on my heels and the callouses on the bottoms of my feet are completely and painlessly removed! My feet are baby soft and pretty. The Pedi Perfect Electronic Foot File is available at drugstores and retailers nationwide including: Target, Walmart, Walgreens, Rite Aid, and Amazon.comfor $36.87 - $49.99. This can be very prefect and good gift to give to mother by her daughter as mother`s day gift. Many people feel confused in selecting the gift for their mothers. For those they can go to http://www.rushmyessays.co.uk/ blog and take the experts advice in selecting the gift for their beloved mothers. Best place to solve the issue of sound not working in windows 10 free without download and signing up. on our site http://nosoundwindows10.com/ and do enjoy.